COURTESY PHOTO | The Shelter Island School boys and girls cross county teams. Back row, from left, Coach Bryan Gallagher, Chanin Inturam, Joshua Green, Will Garrison, Kal Lewis, Jack Kimmelmann, Michael Payano, Liam Adipietro, Jonas Kinsey, Darien Hunter, Coach Bryan Knipfing, Jason Green and Coach Toby Green. Front row, Olivia Yeaman, Lily Garrison, Francesca Frasco, Emma Gallagher, team mascot Chase, Lindsay Gallagher, Caitlin Binder, Lauren Gurney, Justine Karen and Elizabeth Cummings. Not pictured, Tyler Gulluscio, Jack Lang and Walter Richards. Shelter Island’s boys cross country team placed seventh and the girls placed ninth in the 2015 New York State Public High School Athletic Association State Championships. Jason A. 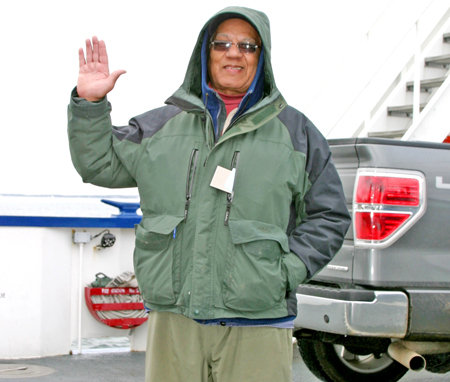 Green captained his last South Ferry crossing at the helm of the M/V Southside on Friday, December 23 after 39 years with the company. Family and crew members greeted him at dockside and the M/V Lt. Joe Theinert gave Captain Green a firehose salute to mark the occasion of his retirement. Captain Green leaves quite a family legacy at South Ferry, which employs Captain Seth Green, Captain Keturah Green, Captain Jason T. Green and his nephew Scott Overstreet.